My household has been nit free for a few months now, so it was a bit of an 'arggghh' moment when I spotted my 5 year old scratching his head during his nativity play. I wasn't sure if it was just his Innkeepers head gear, but on inspection that evening I found a live louse and a handful of eggs. We've been sent Lyclear Treatment Shampoo, so it was the perfect time to try it. I couldn't see anything on my 3 year old, but as they play closely together all of the time it's proven sensible to treat them both together. Lyclear Treatment Shampoo works in 2 ways - by suffocating and dehydrating the lice, and doesn't contain any insecticides, so it's perfectly safe to use on anyone over the age of 2. The shampoo has a really nice smell and looks just like a regular shampoo. You add it to dry hair,being sure to coat all of the hair to the root and then leave for 10 minutes before adding water, bringing it to a lather and then rinsing out as you would with any shampoo. After you've rinsed the shampoo comb with the enclosed fine comb. I liked this comb as it's a fairly standard 'nit comb', but it has a larger hand grip than some. It's been nearly a week now and I inspected my 5 year olds head last night with the comb and couldn't find anything other than a couple of eggs. I will repeat the shampoo treatment in a couple of days just to catch anything that I've missed. After a week any missed eggs (nits) should have hatched and should be killed off by the shampoo. I'm happy with this shampoo. It's very easy to use, smells clean and fresh and a little sweet. 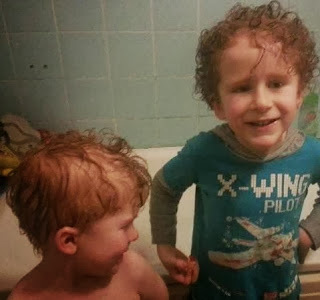 It left my children's hair clean and fairly smooth and appears to have killed any live lice. Lyclear Treatment Shampoo costs around £14 for an 8 application bottle, which is a fair price and it's very effective, so overall should work out cheaper than products which require repeating several times. With my sons very curly hair he hates the combing, so if I can keep that to a minimum he's much happier. Lyclear have created an information page about headlice which you can find on their website. I think we must be really unlucky where we live! Hope you don't have to deal with them too soon! will keep on eye on this if my kids get them! We have avoided the dreaded nits so far this year in school, fingers crossed it stays that way but if not I know what to use. You get all the glamorous reviews don't you? 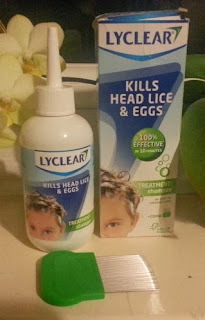 This looks really good though, an easy mess-free way to treat nits has to be useful. Some good tips on here and will defo have a look into it when the time comes. So far so good though - my fingers are firmly crossed! !